Vision - Every child in Florida thrives in a safe, stable and permanent home, sustained by nurturing relationships and strong community connections. Safety. Florida’s children live free from maltreatment. Permanency. 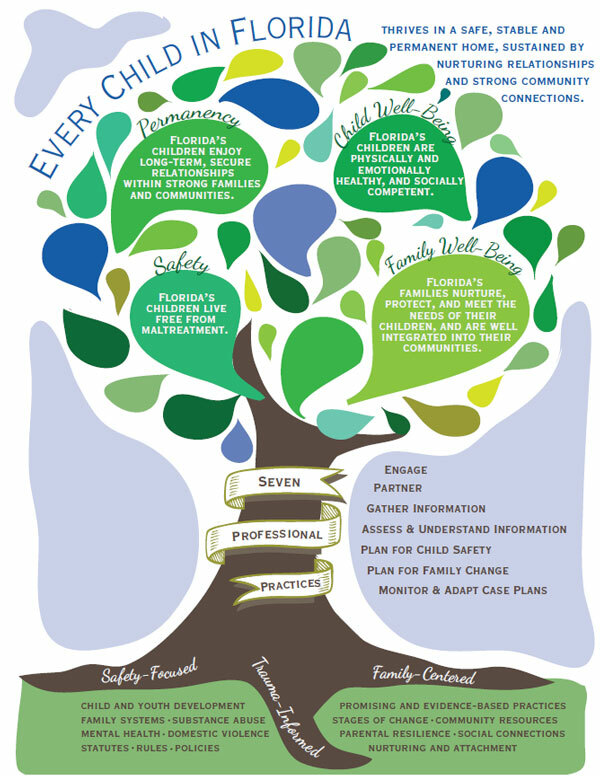 Florida’s children enjoy long-term, secure relationships within strong families and communities. Child Well-Being. Florida’s children are physically and emotionally healthy, and socially competent. Family Well-Being. Florida’s families nurture, protect, and meet the needs of their children, and are well integrated into their communities. Engage the family: Build rapport and trust with the family and people who know and support the family. Empower family members by seeking information about their strengths, resources and proposed solutions. Demonstrate respect for the family as the family exists in its social network, community and culture. Partner with all involved: Form partnerships with family members and people who know and support the family. Partner and share information with relative caregivers and foster and adoptive parents. Include parent and other caregivers in case decision-making. Lead and facilitate partnership with all involved parties to achieve optimum communication, clear roles and responsibilities, and mutual accountability. Gather information: Gather information from the family members and other team members throughout the course of interventions to gain insight into solutions that might work for family members. Update information as underlying issues, including trauma histories, are identified and as the family situation changes. Assess and understand information: Assess the sufficiency of information gathered. Identify and, whenever possible, reconcile unsupported impressions and observations or unverified statements regarding family functioning. Ensure all team members have a shared understanding of both risk and safety information and how this information informs interventions. Plan for child safety: Develop and implement, with the family and other partners, short-term actions to keep the child safe in the home or in out-of-home care. For a child in temporary care, identify the circumstances within the child’s family that must exist for the child to be returned home safely with an in-home safety plan. Plan for family change: Work with the child, family members, and other team members to identify appropriate interventions and supports necessary to achieve child safety, permanency and well-being. Identify services to help the child recover from the effects of child maltreatment and trauma, and to restore typical development to the extent possible. Seek to identify what is needed for the family members and their support network to succeed in maintaining positive changes over the long term. Seek the caregivers’ expertise in case planning and service delivery. Monitor and adapt case plans: Link family members to services and help them navigate formal systems. Troubleshoot and advocate for access to services when barriers exist. Modify safety actions and family case plans as the needs of family members change. Support the child and family members with transitions, including alternative permanency options when reunification cannot occur.